It began with a sudden deafening blast of electric feedback. From there the next 90-minutes were filled with disquieting electronic noise—grinding, chirps, and static—to accompany the events onstage. A dark world revealed a number of archetypal figures, some dancers, some not, including a young, hunched woman with dirty small angel wings who would periodically shriek at the top of her lungs for a world of woe. This is part of The Tempest:Without a Body a dance/performance piece from choreographer and activist Lemi Ponifasio and the collective MAU, which he helped form in New Zealand in 1995. The work is receiving its U.S. premiere in Los Angeles for two nights only, April 2 and 3 under the auspices of REDCAT, which has packed up shop for the show and moved temporarily to digs in the historic Million Dollar Theater on 3rd and Broadway in downtown Los Angeles. (If you've not seen this great old L.A. landmark, it is reason enough to see this show.) As you might gather from the description, Tempest is at its very core distressful and unsettling, which it is intended to be. Ponifasio and the artists, activists, scholars, and working people who make up MAU have created a work covering a huge range of issues including the state of social justice in a world wracked by terrorism. Ponifasio, Samoan by birth and living and working in New Zealand, has rapidly ascended to the upper echelons of the choreography world in the last decade with appearances around the globe. His work is visually stunning, and like the best of Pina Bausch, often relies in part on participants who aren’t necessarily dancers and whose movement is about other issues than athleticism. 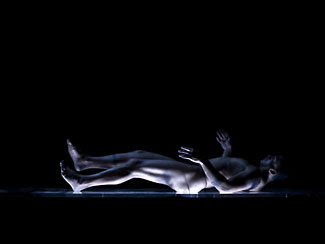 The Tempest: Without a Body (which you can see a sample from above) draws on a wide array of figures and the movement itself can be slow and minimal at times. Among these figures are the aforementioned angel, men who move on four limbs like animals, slow moving Promethean figures painted in silver, and others whose movement and manner are influenced by Maori and other pacific island dance traditions. From the minute the show gets started with its burst of sound you feel the sense of uncertainty, the same one that is all too familiar in one’s day-to-day life in this modern age. The audience is also invited to view the many different characters on stage as references to those in Shakespeare’s The Tempest. The angel could be Ariel, and the older man who “smashes” what looks to be a plank, but turns out to be nothing more than a chalk-like powder may be Prospero. There is another man with body tattoos and a full facial moko who recites a political text about the use of unlawful detention who could be seen as a reference to Caliban by European audiences. (This part was played in earlier versions of The Tempest by Maori activist Tame Iti, who has withdrawn from the North American performances in protest over the US participation in the No-fly zone over Libya, and was replaced by Charles Koroneho.) But, Ponifasio is not looking for something that clear cut or easily allegorical. Instead, the performers and dancers fade in and out of the dark often dramatically lit from behind as if they are the proverbial “Children of the mist," the Tuhoe people of New Zealand. What I’ve mentioned so far only begins to scratch the surface of the philosophical and intellectual underpinnings of the work with Ponifasio making reference to subjects as diverse as the work of Walter Benjamin and the Waitangi Tribunal. How this all actually translates onto the stage which is dominated by a large hanging grey wall on the left, is hard to know. But The Tempest: Without a Body is a rare and wonderful thing. It is certainly unlike anything else you’ve seen before and it does have a magisterial and ceremonial feel at times. Ponifasio has the amazing ability to create an entire world unto itself that abducts the viewer into it without having to explain everything. The show is unsettling and like its theme, keeps the viewer on edge with a fearful anticipation amidst its beauty at all times. It's a rare evening and one that is not easily forgotten. I'm looking forward to seeing this on Thursday night when it begins a three night run here in SF. Great, I think you'll find it interesting. Just be prepared for the screaming and the chalk-dust cloud that will send everyone into psychological fits of coughing.